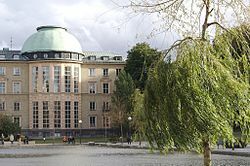 Stockholm School of Economics (SSE) was founded in 1909 and is one of Europe’s leading business schools. SSE is accredited by EQUIS and has internationally-renown research. SSE runs an extensive student exchange program with a number of top ranked universities and business schools all around the world. Each year, SSE sends over 200 students abroad and hosts over 180 exchange students.